The city of Zhengding 正定, in modern Hebei Province 河北省, was once the medieval home to several large Buddhist monastic compounds. Besides Longxing Temple 隆興寺, one of the longest surviving monasteries along the north-south axis in China, scarcely much of the ancient architecture remains of the other temples. Four multi-story pagodas at four different sites still survive, however, all within a few square miles of one another. Modern tourism posters for Zhengding show these iconic towers all aligned piercing the sky in digitally reworked photographs. While the “Four Pagodas of Zhengding” 正定四塔 are a boon for tourism, these four Buddhist structures also provide a good spectrum of pagoda styles, sizes, and construction materials. Using these pagodas as exemplars, I will briefly explore the evolution of the pagoda structure in China, arguably the best-known and most iconic architectural form in East Asia. The pagoda (C. ta 塔) was a Chinese adaptation of an Indic architectural form known as the stūpa. Importantly, before the introduction of Buddhism into China in the first century, native Chinese architecture did not emphasize verticality. There were a few multistory structures, such as pavilions (ge 閣) and watchtowers (lou 樓), but the widespread use of timber frame structures built upon a post-and-lintel system made “horizontal sprawl” the dominant spatial feature. It appears that the motivation to build higher was inspired by tall Gandhara-style stūpas, and although it is unknown how Chinese builders initially conceived of the foreign structure, they likely conferred with sketches and possibly small votive stūpa models in addition to verbal accounts from travelers. The oldest surviving pagoda in Zhengding is found at Kaiyuan Temple 開元寺, which was razed almost entirely to the ground during the cultural revolution. The original monastery was constructed in 540, but only the pagoda and Bell Tower 鐘樓 remain. The pagoda is known as the Sumeru Pagoda 須彌塔, named after the cosmic mountain at the center of the Buddhist cosmos. The pagoda is a nine-story brick structure rising to a height of about 40 meters. Built in 636, the structure has a square shape, mirroring the construction of Han watchtowers and older timber pagodas. Even though it was renovated in 898, the Sumeru Pagoda still maintains distinctive Tang era (618-907) characteristics, with stepped registers, triangular eaves, and unadorned brick walls, creating an elegant, yet imposing architectural form. This Tang style of brick pagoda is also found in the ancient capital city of Chang’an 長安 (modern Xi’an 西安), where we find both the Great Wild Goose Pagoda 大雁塔 and Small Wild Goose Pagoda 小雁塔. Also known as the Brick Pagoda 磚塔, this structure is hallow, with no central pillar or staircase to ascend. On the outside there are two pot-bellied guardians (noted as lishi 力士 on site) at the base of each wall, designed to look as if they are bearing the weight of the building on their shoulders. Above the doorway is a horizontal inscribed tablet 匾額saying “Sumeru stands tall” 須彌峭立, highlighting the verticality of the structure and linking it with the height of Mt. Sumeru. In 2007 a secret above-ground “heavenly chamber” 天宮 was found during renovation, containing 4000 items dating from the Warring States (475-221 BCE) to the Qing Dynasty (1644-1911). A second pagoda is found at Linji Temple 臨濟寺, home to the renowned Chan master Linji 臨濟 (d. 866). Unlike the other compounds in Zhengding, this temple has been fully restored, in no doubt due to the fame of Linji in Japan as founder of one of the two major Zen schools. Of the other notable buildings (all constructed after 1986), there is a Dharma Milk Hall 法乳堂, housing images of Linji, Bodhidharma, and Huineng (there was a photograph of Xuyun 虛雲 also placed on the altar), as well as a Meditation Hall 禪堂, the mythic location where Linji inspired his students to enlightenment through his innovative shock techniques. According to tradition, a pagoda was first built in 867 to house the robes and bowl of Linji, along with half of his relics that remained after cremation (the other half was interred in a now destroyed pagoda erected in Daming 大名). The emperor named it Chengling (“pure spirit”) Pagoda 澄靈塔, along with conferring the posthumous name of Huizhao 惠照 to Linji. The current pagoda, however, was constructed in 1185, and bears the distinctive hallmarks of a later style of construction. It is a nine-story brick structure of around 30 meters in height. Most notably, however, it is octagonal, following a design that became popular in the tenth century under the influence of the Liao 遼 (907-1125). A semi-nomadic people from the north with no native architectural expertise, the Liao rulers employed Chinese craftsmen to build the eight-sided pagodas all over northern China, with the style eventually spilling over into the south. The Chengling Pagoda is also known as the Dark Colored Pagoda 青塔 due to the dark grey bricks used for construction. As was common at the time, the masonry mimicked timber pagodas, complete with facsimile lintels and posts, complex bracketing systems (dougong 斗拱), tiled eaves, and latticework windows. The first story is also made to appear as if springing forth from a lotus flower, with petals circling its circumference, and comprises a part of what architectural historians call a Sumeru Throne 須彌座. All of these details give the pagoda a delicate and ornate feeling as it spires into the air. A very similar architectural plan was used to construct the memorial pagoda for Zhaozhou 趙州 (778-897, J. Jōshu), another famed Chan practitioner, in 1330. The third pagoda is found in the remains of Tianning Temple 天寧寺. The original pagoda was built in the late eighth century, but it was replaced in 1045 during the Song (960-1279). It is a nine-story structure rising to around 42 meters high. Interestingly, its construction is composite, being made of bricks up to the fourth story and wood for the remaining five stories, making it one out of two surviving pagodas built in this fashion, with the other being the Wanshou Timber Pagoda 萬壽木塔 in Gansu Province 甘肅省. Starting from the fourth story, a central pillar (xinzhu 心柱) is used to support the upper structure. The use of a central pillar was once an important feature of older pagodas, but its use started to subside throughout the Song. Originally called the Huiguang Pagoda 慧光塔 (“Wisdom Light Pagoda”), it is now referred to as the Lingxiao Pagoda 凌霄塔 (“Reaching the Firmament Pagoda”), although locally it is called the Timber Pagoda 木塔, due to the ample use of wood for construction. As the building ascends, the height and circumference of each story decreases, adding to the sense of verticality as the top story appears to vanish into the heavens. The pagoda was frequently renovated over the centuries and significant damage occurred during a 1966 earthquake. In 1982 an underground chamber 地宮 was discovered, revealing some inscriptions firmly dating the original pagoda to the Tang (618-907). The final pagoda is located on the grounds of the old Guanghui Temple 廣惠寺, originally constructed during the Tang. 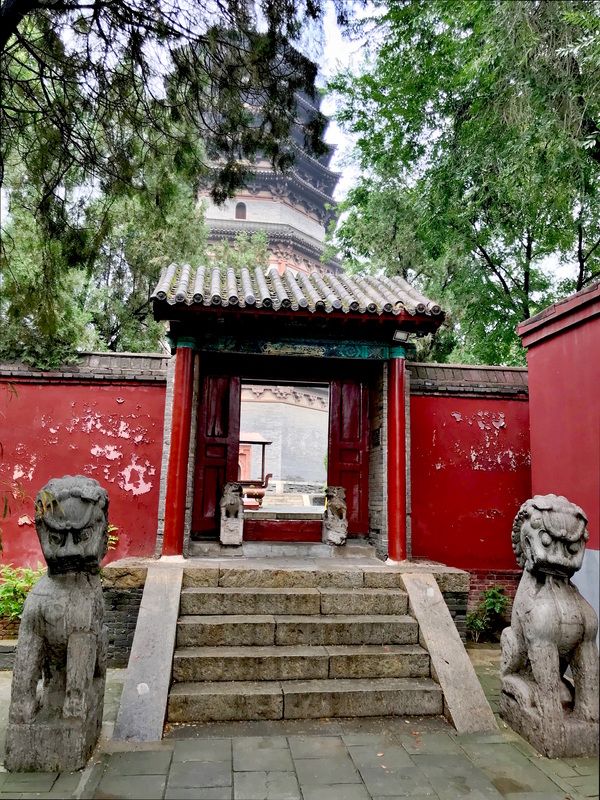 There are stories of the famed emperor Qianlong (r. 1735-96) visiting the temple to compose poetry, but noting now remains outside of the odd-looking pagoda, called the Hua Pagoda 華塔 (“Flower Pagoda”). The unconventional pagoda is four stories with a height of about 35 meters. The first floor has a series of four small pavilions at each corner of the building each topped with an egg-shaped finial, giving the pagoda an overall octagonal shape (This is more easily detected by closely examining the second story). The top of the pagoda displays a richly decorated conical spire, approximating the shape of a lotus bud, thus providing the name for this structure. Flower pagodas are actually a class of pagoda that started appearing in the Northern Song (960-1127), and of the 15 remaining specimens, the one in Zhengding is considered among the most ornate and grandiose. Its base is made of brick in a style that attempts to copy timber structures, as we saw with the Chengling Pagoda, which is possibly part of later renovation attempts. Replacing the tiered eaves, the conical spire, constituting approximately one-third of its total height, is what makes this pagoda so curious. It is adorned with an array of pot-bellied guardians, heavenly kings, elephants, lions, bodhisattvas, and buddhas. Moreover, the interior of the pagoda houses Buddhist statues that date from the Tang. Because of this, the Flower Pagoda was classified in the first round of Major Historical and Cultural Sites Protected at the National Level 全国重点文物保护单位 in 1961. Overall, the Four Pagodas of Zhengding offer interesting insight into the development of the pagoda architectural form during the late medieval period. Even though brick soon became the construction material of choice, timber was used to top-off the Lingxiao Pagoda or it was mimicked through careful craftsmanship, as with the Chengling Pagoda and Hua Pagoda. Furthermore, while native four-sided timber structures influenced the shape of earlier pagodas, as with the Sumeru Pagoda, the use of octagonal forms became more widespread with the use of brick structures in the Song and Liao. * This post was written as a personal addendum to the lecture I gave on Sacred Buddhist Architecture at the 2018 Woodenfish, and as a means to make sense of all that I saw on my unexpected trip to Zhengding. Thanks for the adventure, Guttorm! Fu et. al. 2002: p. 166-7. While Longxing Temple does not have a pagoda, the central focus of the monastery is its large Dabei Pavilion 大悲閣 placed on the main axis behind the main shrine hall at the rear of the compound. Constructed in 971, it houses a bronze Thousand Arm Guanyin statue, about 24 meters in height. Ibid. There is evidence suggesting that one of the 112 wooden pagodas built by Emperor Wen of the Sui 隋文帝 (r. 581-604) commemorating the miraculous discovery of Buddhist relics was constructed at Longxing Temple. Furthermore, the depiction of Zhenzhou 鎮州 (modern Zhengding) on the Map of Mt. Wutai 五台山圖 and its environs found in Cave 61 of Dunhuang 敦煌 (constructed c. 950CE) shows a three-story pagoda, which some understand to be the one ordered built by imperial edict, see here. For clear depictions of the relevant portions of the map of Mt. Wutai, see here. Drawing stūpas appears to have been a common devotional practice for Buddhists travelling to China, as is evidence by numerous examples of stūpa graffiti on rock walls. See Neelis 2001: esp. 281 & 283 for images. The oldest dated timber and brick pagoda in China is the octagonal Śākya Pagoda built in 1056, Le 2010: 185. Older wooden pagodas exist in Japan, including the famous Gojū-no-tō 五重塔 at Hōryū-ji 法隆寺. The signage at the site lists its height at 42.5 meters, but I’ve seen heights between 39.5 and 47 meters listed elsewhere. Historians can examine wooden pagoda structures in the murals at Dunhuang, such as Cave 61 noted above, and in relief carvings at Yungang Grottoes 雲岡石窟, such as in Cave 39. It is well known the legend of Linji was developed well after he died, most notably contained in the Record of Linji 臨濟錄, compiled in 1120. See, inter alia., here. For more on Liao architecture, see Steinhardt 1994 and Kim 2017. The plaque on site lists its height at 33.35 meters, but other sources claim its height to be over 40 meters. For more about Flower Pagodas, see here. Fu, Xinian; Guo, Daiheng; Liu Xujie; Pan, Guxi; Qiao, Yun, Sun, Dazhang & Steinhardt, Nancy S. 2002. Chinese Architecture. New Haven: Yale University Press. Kim, Youn-mi. 2017. “Virtual Pilgrimage and Virtual Geography: Power of Liao Miniature Pagodas (907–1125),” Religions, Vol. 8., pp. 1-29. Le, Huu Phuoc. 2010. Buddhist Architecture. Lakeville, MN: Grafikol. Lin, Wei-cheng. 2016. “Performing Center in a Vertical Rise: Multilevel Pagodas in China’s Medieval Period,” ARS Orientalis, Vol. 46, pp. 100-34. Neelis, Jason. 2011. Early Buddhist Transmission and Trade Networks: Mobility and Exchange within and beyond the Northwestern Borderlands of South Asia. Leiden: Brill. Seckel, Dietrich. 1980. “Stupa Elements Surviving in Eastern Asian Pagodas,” in The Stupa, Its Religious, Historical, and Architectural Significance, ed. Anna Libera Dallapiccola and Stephanie Zingel-ave Lallement. Wiesbaden: Franz Steiner Verlag. Steinhardt, Nancy Shatzman. 1994. “Liao: An Architectural Tradition in the Making,” Artibus Asiae, Vol. 54, No. 1/2, pp. 5-39. Steinhardt, Nancy S. 1997. Liao Architecture. Honolulu: University of Hawaii Pres. Steinhardt, Nancy S. 2011. “The Sixth Century in East Asian Architecture,” Ars Orientalis, Vol. 41, pp. 27-71. Steinhardt, Nancy S. 2014. Chinese Architecture in an Age of Turmoil, 200-600. Honolulu: University of Hawaii Press.